>> For the 224-252 LaTrobe St site, Elenberg Fraser's design was named as the winning scheme. Featuring a Malaysia-Melbourne cultural integration, the design include a vibrant [b]retail podium with direct underground connection to Melbourne Central[b], a sculpted 50- and 78-storey tower that house the residential units and facilities, and a unique star-shaped floor plates, offering each residential unit some of the most treasured views in Melbourne. “This development will offer one of the most generous provision of communal facilities to the residents and this will set the project apart from the rest in the market,” said Callum Fraser, founder of Elenberg Fraser. “The winning designs were selected because they are unique solutions that best capitalizes and accentuates the special attributes accorded by each sites; they encapsulates and amplifies the genius loci or the 'spirit of the place',” said Raymond Cheah, the Chief Operating Officer (Commercial) of UEM Sunrise. This town is going to be littered with EF relics. Hope this design is good. Can't wait for clearer renders ..
Malaysian newcomer UEM Sunrise Berhad will build two high-rise towers at 224-252 La Trobe Street that will soar 78 levels above the city on a site it bought just two months ago. The apartment buildings have yet to gain planning approval but UEM, one of Malaysia's largest listed property developers, is confident they will go ahead and has begun publicising them in its home town of Kuala Lumpur. UEM chief operating officer Raymond Cheah told Malaysian news organisations La Trobe Street would have about 1000 apartments in two towers rising more than 60 floors each. They will sit above a five-storey retail podium. UEM finalised the purchase of La Trobe Street and another city site, at 9-23 Mackenzie Street, from property investor Jimmy Goh for $65 million in October. The nine-storey car park on the La Trobe Street site will be demolished to make way for the new towers. Work is expected to start in 2015, subject to planning approval, and finish in 2017. The Mackenzie Street site will have a 35-storey tower with 388 one, two and three-bedroom apartments priced between $400,000 and $600,000 each, Mr Cheah was reported in Malaysia's Business Times as saying. UEM's Melbourne project manager, Andrew Fortey from PDS Group, said the proposed La Trobe Street buildings would have an underground passage and an overhead pedestrian walkway connecting them to Melbourne Central shopping centre and the metro railway station opposite. The development might also include a 250-room hotel, he said. I thought we'd decided no more pedestrian walkways in this city anywhere EVER again?? Wonder if they've bothered asking Melbourne Central or whether it's just kite-flying. If it's not costing GPT anything I see no reason why they would oppose it particularly when it means potentially more foot traffic passing through their centre. CoM generally don't support airbridges but Matthew Guy will have the final say. Despise the idea of elevated and enclosed walkways myself. LA Trobe street is in the council's crosshairs for more traffic calming - note the introduction of "copenhagen" bike lanes which has reduced space for vehicular traffic - building pedestrian overpasses / underpasses will countermand that in the longer term. Street level or nothing. Application submitted to the minister. This one should be a ripper. beat me to it, can't wait for this one..
No issue with PANS-OPS? What's the site's height limit if CUB is only around 250m? Looking forward to seeing and hearing more about this one: yet another huge proposal for the north end of the city.It seems there are no holy cows up there to be touched by shadows. 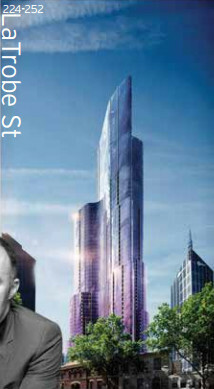 A $350 million mega-tower proposed for La Trobe Street will be double the size of any other Melbourne apartment building and the third largest in the world by floor area, if approved. The massive residential skyscraper, the city's largest to date, will house a population equivalent to the small Gippsland town of Foster in its 1343 apartments which are set behind a soaring, fluted, glass exterior. A listed Singaporean development company UEM Sunrise is behind the project, on a La Trobe Street site opposite Melbourne Central shopping centre. The huge structure will rise 285.5 metres or 82 storeys into the air and dominate the city's skyline. Interesting that the view is from looking up Lt Latrobe Street from Elizabeth Street and not from the Latrobe Street frontage. This tower will be 268.5 meters above ground, 285.5 meters above sea level. I recall in the 1990s after Melbourne Central / Myer built their large skybridge over Lonsdale that the Planning Scheme was amended to 'ban' bridges, but only over heavily pedestrian roads such as Swanston, Eliz, Flinders, Collins and Bourke Street - and Lonsdale Street ? But cant find such a thing anywhere in the current planning scheme. And it wouldnt have presumably applied to the not so pedestrian parts of those streets ..... anyway, a bridge here is only logical since it extends the main mid block pedestrian route through the CBD from Degraves Street onwards - though having said that, its a 9-6pm route only since it ceases to exist after Myer closes their doors. As to this proposal, no problem with the height, though I note that the planning scheme actually says this block should have a maximum plot ratio of 4.5 : 1 ! but that part of the planning scheme has simply been ignored by the Minister's planning department for the last 10 years at least. My main concern is that it seems to have a minimal or possibly non-existent podium, which would be a big problem on both street fronts - on Little La trobe especially, the low scale streetscape would be completely dominated (though I now see that its already been partly destroyed by 22-32 Litt Latrobe what a shocker who let that through this is heading straight for narrow canyon status ! ), and the wind effects might be horrendous, with large north facing facade. And on La Trobe Street, this is not exactly a nice bit of street but at least everything is low scale frontages and theres plenty of sunlight, and it should / could be a high pedestrian area, so certainly some pedestrian scale street level building base would be desirable, rather than something that rises as a single glassy spire into the sky - a nice image, but would sit very oddly. I like my buildings to part of an urban street ensemble, not a series of individual statements, at least at street level. Oh, and since this tower is quite wide, it will of course cast a 10 months / year shadow over a large part of the street. "Ensure the area bounded by Latrobe and Victoria Streets and Elizabeth/Peel Streets has a lower scale than the Hoddle Grid and provides a contrast in built form scale between the lower"
Ooops ! Its about to be the other way around ! ^^ Mighty mega majestic, a perfect fit for marvellous Melbourne! It's like Aerial in Camberwell had a growth spurt.